Owen Woolridge riding on his bike. HURRICANE MILLS, Tenn. — Owen Wooldridge, 6, is about to compete on a national stage. He is from Gallipolis and attends Rio Grande Elementary School. He has qualified to compete at Loretta Lynn’s Ranch in Tennessee for the Rocky Mountain ATV/MC AMA Amateur National Motocross Championship. Even though Owen is 6-years-old, he has qualified to be one of 42 qualified riders throughout the world to ride in the event. Owen’s family says making it to Loretta Lynn’s is a “big deal” for amateur riders as only top riders make it there. Owen is one out three riders to qualify from Ohio in his age group to make it to the championship. Owen’s racing has become an affair for his entire family including his parents, Tyler and Jill Wooldridge, and sister Lauren. The family says they are proud of Owen for all of his achievements as he works hard to accomplish them. They spend most of their weekends at the race tracks. Owen was two-years-old when Tyler got him onto a dirt bike and he has been riding for the past four years. 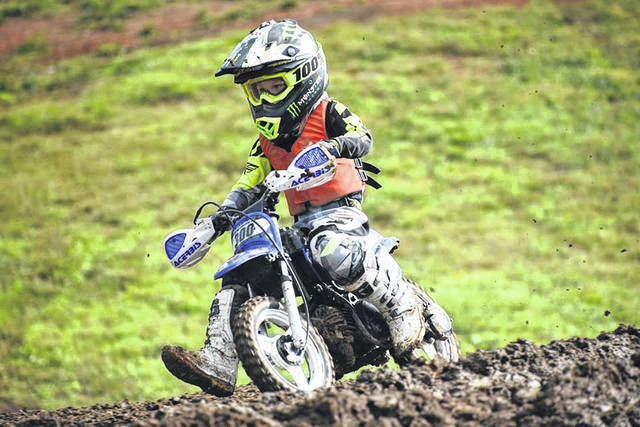 Going to the championship is a dream coming true for Owen since competing and winning motorcross events are his passion, say family members. Owen rides a Yamaha 51 cc Bike #300. 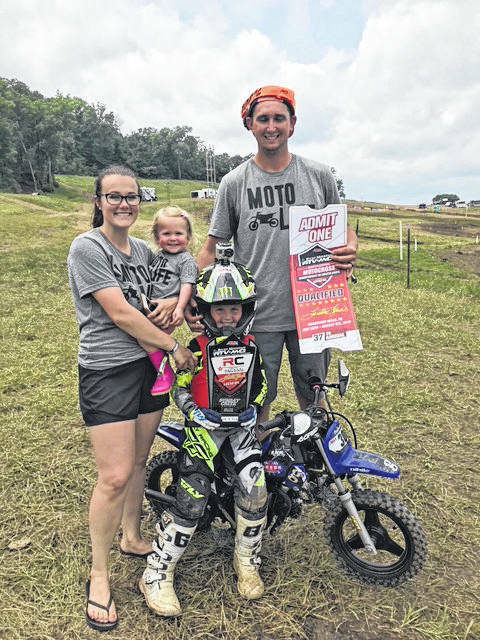 Owen is the third generation of Gallia County Wooldridges to ride motorcycles in competitions which include Owen’s father, Tyler Wooldridge, and his grandfather, Tadd Wooldridge, along with his uncle, Tayler Wooldridge. Tyler does all of the mechanic work to keep Owen’s bikes running. Jill is his personal EMT and special support system. Last year was Owen’s first full year of competing. He races in District 11 American Motor Cycle Association. Owen took third place in Chillitown, Chillicothe, fourth place in Sunday Creek Regional, Millfield, second place in Big Sandy Super Store Arena, Huntington, W.Va., and first place as championship winner at Mason Motor Cross, Mason, W.Va., and various other local competitions. Owen will be in Tennessee July 31-Aug. 4 for the big competition. Owen will race in the ages 4-6 shaft limited 51 cc class. He rides a Yamaha 51cc. His racing number is 300. As they get ready, his parents said he has been riding regularly to be ready for the big race. Many of the other racers who will be riding at the event will be going there with brand new bikes, trainers and big campers. Owen has made it without deep financial backing or special training. Own and his family are thankful to Fly Racing, motocrossvest.com, Nihilo, Mika Metals, Motosports MD, @g3racing214 for the mechanical work, @brycen_neal for the pointers on and off the track as well as everything else, @wayupapparel_co for the “sweet swag,” @masonmotocross for a place to ride, the sticker kits, goodies, and everything else for sponsorship of his local events. Many of the races will be broadcast live online at https://livestream.com/RacerTVLive. https://www.mydailytribune.com/wp-content/uploads/sites/42/2018/07/web1_Owen-Wooldridge-Bike-300.jpgOwen Woolridge riding on his bike.